For three short, but blissfully fulfilling years of my life, I had a cush job. I was showered with presents on a regular basis. I had foreign men fawning all over me. I ate the finest cuisine and attended soirees held in my honor. It was a life of excitement, romance and danger. Nope, I was an ESL teacher in Chicago. Not what you were expecting, was it? This was pretty much the best job of my life. I received tons of gifts for every holiday and at the end of each semester. These were actually students who loved coming to class. And they appreciated my hard work! Sometimes I even received gifts just because: a bunch of flowers here, a plate of tamales there. These students were like the most attentive boyfriend in the world! There was Joel, a hot 19 year old who regularly tried to get my attention in class so he could flirt. One day, when I asked for a volunteer to use the word "plenty" in a sentence, Joel said, "Teacher, I have plenty love for you!" And what red-blooded woman out there doesn't appreciate romantic marriage proposals from handsome, Hispanic men? Okay, yeah, Marcus may have offered me $3,000 to marry him so he could get his green card, but that doesn't mean his love for me was any less genuine or passionate. Most of my students were Hispanic or Polish and they were all very generous. When they learned what a pig, glutton, hefty eater gourmand I was, many of my students brought me plates of delicious food. I was afloat in pierogi and tamales, mole and posole. And when we had our end of the year parties? I was plied with horchata, tostadas, guacamole and three milk cake. I just drooled on my keyboard at the memories. You don't think teaching ESL is dangerous? Well, let me relate a story, then. 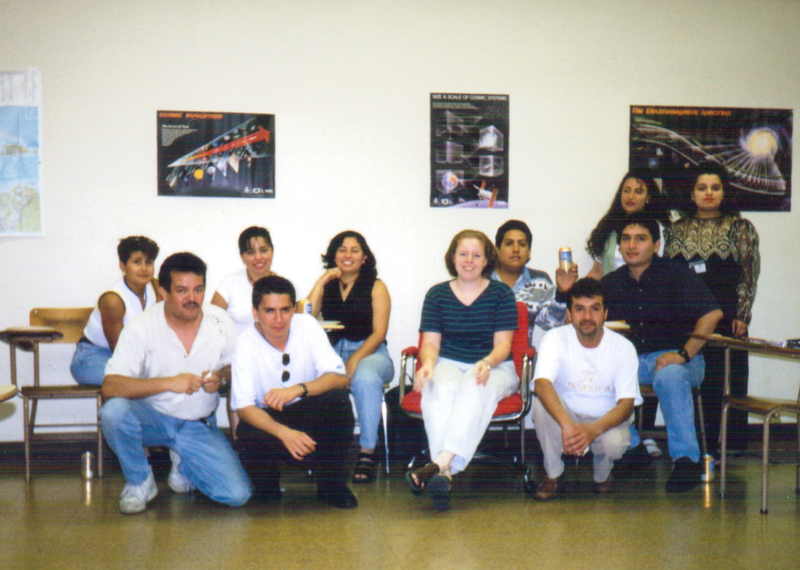 My first semester, I taught an advanced ESL class and the final consisted of giving an oral presentation. 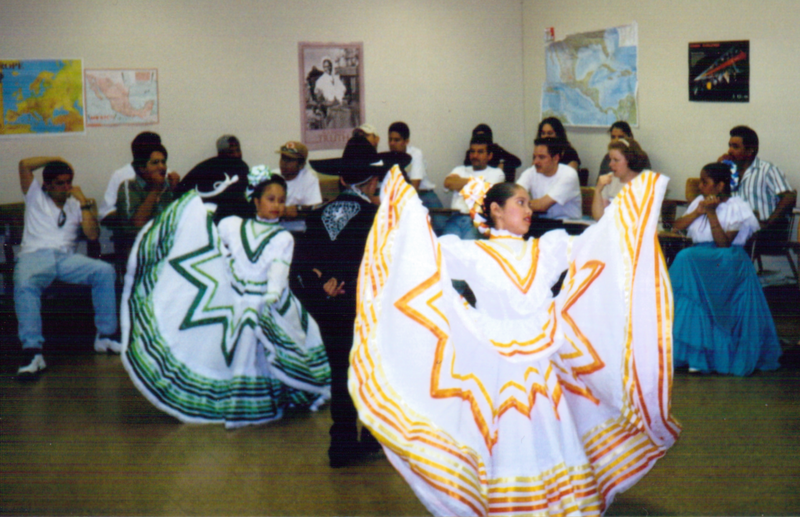 One student, a dance teacher at his local community center, asked if he could have the children in his class come and perform. I was delighted at the opportunity to learn more about his culture. The children came to class, adorable in their authentic Mexican garb, and they danced their hearts out. While swinging machetes around their heads. Yeah, I got in big trouble when the Dean heard about that one. For more posts about ideal jobs, stop by the Spin Cycle at Gretchen's Second Blooming. In second grade, after Sister Winifred warned my mother that I was too shy and in danger of becoming a social outcast, my mom staged an intervention. She sat me down and shared with me her experiences as a painfully shy girl. Mom encouraged me to seek out another girl who was quiet and looked in need of a friend and strike up a conversation. And that's what I did, though it scared me almost speechless. And that's how I became friends with Jane, a wonderful girl who, though quiet, was delightfully funny and kind. Later still, I befriended Michelle and Jennifer and we formed our own little quirky club, sharing books, eating snacks and having our wacky preteen adventures. If it weren't for my group of friends, I'm not sure how I would have handled the bullying I endured everyday through seventh grade. Most days, I came home crying over the things Sharon and Vicky said to me--the way they mocked my clothes, my hair, my glasses and my lack of makeup, among many things. These experiences solidified in my mind how very ugly and unattractive I was. But one thing they never convinced me of: that I was undeserving of friends. Because I, I had this terrifically smart, staunchly loyal, and whimsically fun group of friends. Though we weren't in the popular group, I knew we were cool, because we always had a blast. I believe in the healing power of friendship. I believe each and every child deserves and needs a good, loyal friend who will stand by him through anything. I believe that type of friend can give us courage to stand up against bullies (like I did in seventh grade when Paul Forrest was bullying my twin brother--a post for a different day). I believe those friends can give us hope to endure just about anything. Which is why I have been so worried about my son. You see, Danny doesn't really have any friends at school. He never comes home talking about his buddies or asking if they could come over for a play date. And his autism makes him stand out so that sometimes other kids avoid him. This is why I started our LEGO Club. These kids deserve friendship. And they need it. They really need it: One 6-year-old boy, recently told his parents that all he wanted for his birthday was a friend. A, also 6, told his mom that everyone at school hates him. And S, who is 10, says she has no friends at school. My Danny told me that making friends is really hard. This? This is something that breaks my heart into tiny fragments of sadness. These kids are terrific: loyal and funny and smart as whips. They are fantastic! And they deserve acceptance and friendship. They may have difficulty connecting with others because of autism or ADHD or shyness or just because they happen to be different (like I was), but that makes them no less wonderful and in need of friendship. I believe if our kids have good friends, they may be less likely to turn to drugs or alcohol or other self-harming behaviors. I believe it may prevent suicide and help with depression. One good solid friend may give our kids hope when things look bleak. At least that's what I hope for, anyway. On LEGO Club nights, S begs her mom to let her stay longer and play because "these are my real friends, mom! Don't you WANT me to have friends?!?!" Danny often gets a touch weepy on the way home, because, "Mom, I'm going to miss my LEGO members! They're my friends!" A said that she has the "best group ever!" and her group mate, J declared that "LEGO Club is awesome." Best of all, my son told me that everyone at LEGO Club is his friend. And that means more to me than a hundred glowing report cards. Because I believe wholeheartedly in the power of friendship. I writhe in pain as my teeth start breaking off in my mouth. I realize this is happening because I am clamping down on my teeth with such terrible force, but I can't seem to make myself stop. I try to relax my jaws, but nothing works, and I just lie there helplessly as tooth after tooth breaks off. I almost vomit as I run my tongue over the jagged remains of the teeth and I wonder what I can do to save them. Anguish washes over me as I realize all my teeth are gone. This is the one dream I have that is recurring. I don't have it often, but when I do, I'm shaken for the rest of the day. Anything with teeth freaks me out. I dread dentist appointments with a fierce passion. I almost have a panic attack when they poke my teeth to find cavities. I have practiced more Lamaze breathing techniques at the dentist's office than during the births of all three of my children. 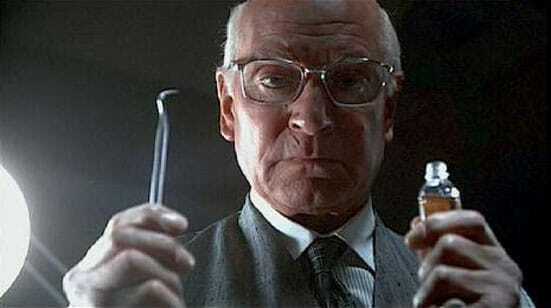 That scene in Marathon Man where the dentist drills Dustin Hoffman's teeth with no anesthetic horrifies me. Which is why this particular dream is so nightmarish to me. And why it seems supremely unfair that I have it at least a couple times a year. So, what could be worse than having a recurring nightmare about your worst fear? Having that dream actually come true. Which is exactly what happened to me one fine afternoon in college. I was sitting in the hallway before Chinese class, chewing some gum when I heard a terrifying crack. When I felt something crunchy in my gum, I nearly lost my lunch. I rushed to the bathroom to inspect my tooth, but everything appeared normal. I couldn't tell if anything had broken off or not, so I did what I normally do in very unpleasant situations. I pretended everything was hunky dory. I was violently wrenched out of my comfortable state of denial when I heard another earsplitting crack during class. The gaping hole in molar mocked me as I sat in class swallowing down my sobs. On the verge of hyperventilating, I tried to clear my thoughts, but I was overcome by panic. All I could think was that my nightmare was coming true. My teeth were cracking off one by one and there was nothing I could do to stop it. Soon, my mouth would be filled with the jagged, splintered remains of my teeth, that I was sure there was no way to fix. I didn't eat for days for fear that more of my teeth would crack off, leaving my nerves exposed and pulsing with pain. My new dentist later informed me that my tooth broke because of a root canal that had been performed a few years back. Apparently, root canals can make the tooth become brittle and easily broken, which is why most dentists put a crown on it. Unfortunately, for whatever reason, my dentist hadn't informed me of this. Still, even armed with this information, I am living with the unshakable certainty that my teeth are just waiting for the perfect moment to drive me into the pit of despair. Someday, they will revolt and start cracking off, leaving me with jagged, horrifying teeth that will cut my tongue and make strangers gape at me. Just when I think I have put this incident behind me, I have that terrifying nightmare. For more posts on dreams that are surely far less macabre than this one, visit the Spin Cycle at its new home at Second Blooming! 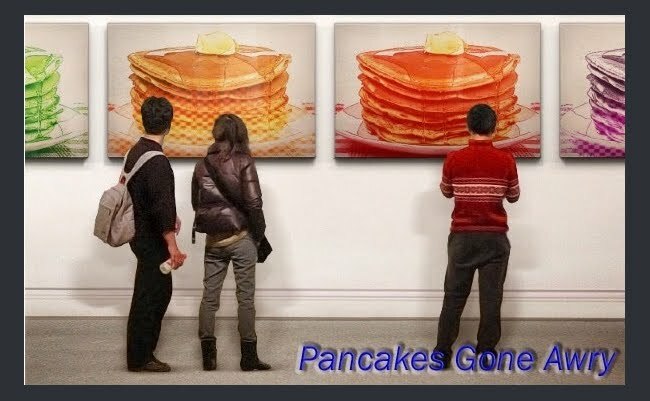 Lisa over at Autism Wonderland has come up with the greatest idea. 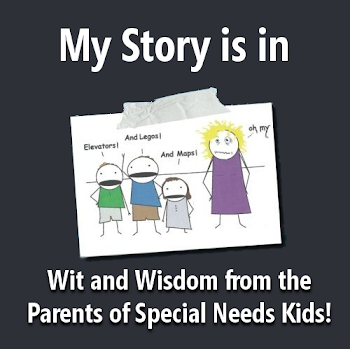 Every Monday, she is encouraging special needs parents to blog about some accomplishment their child has made recently. 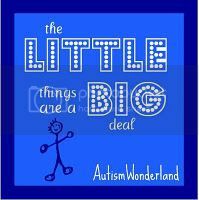 As special needs parents, we understand that the seemingly "small" accomplishments are not insignificant for our children. A milestone that might seem very mundane to a parent of kids without special needs, is in fact a huge thing for our kids. I love this idea and am excited to join in Lisa's meme. This week for us it was that Danny figured out how to ride a bike with no training wheels. And he did this entirely on his own! No pushing his bike and running behind him. No coaching or encouraging or bribing. Nope, my husband just took off the training wheels and all of a sudden, Danny was riding his bike like a pro. It was a miracle, especially in light of the many motor planning difficulties Danny has struggled with! To put this in perspective for you, Danny was very late in learning how to pedal a Big Wheels bike. It then took him months to be able to steer and pedal at the same time. He finally graduated to a bike with training wheels. Though he is already 8 years old, we assumed it would take many more months and much help and coaching before he could master this skill. After all, so many of Danny's milestones required months of direct instruction from us. So, what about you? What has your child done recently that has made you grin with pride? 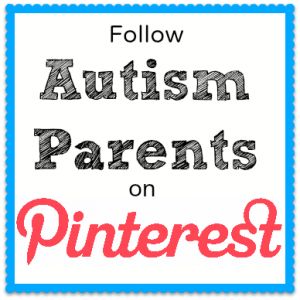 Make sure to visit Autism Wonderland, too, to see more posts about these heartwarming accomplishments. Let's celebrate together! I seek the approval of others. In fact, I put waaaaay too much emphasis on others' opinions of what I am doing, at times. I have worked on it a lot, with therapy and lots of self help books, but this drive for approval is still there. Still lurking, at times rearing its ugly head unexpectedly. I realized this after I recently sent out an email to all my friends and family containing the youtube video about our LEGO Club. Let me preface this by saying that this LEGO Club is my pet project. It means so much to me because it is helping my son develop needed social skills. Every time I think of LEGO Club it gives me warm fuzzies, because I know it's what I am supposed to be working on right now. I know it's helping kids and it feels so good to finally feel like I am actually helping Danny in a productive way, when it comes to social skills. And I feel so empowered because instead of sitting around worrying and complaining, I actually did something about a need in our area. It feels good. So, we made this video to show Pepsi how their money helped us. I sent it out to people to thank them for all their votes and to let them know it made an enormous impact in our lives. Many people wrote me, including some I barely know. They expressed their excitement for the program. Still, it wasn't enough, because there are certain people who are very close to me who never wrote me. At least one of those people actually told me in a phone call that she hasn't even bothered to watch it. She's too busy. This really hurt my feelings. Mostly, because these particular people do this a lot. They barely seemed to bat an eye when I told them I was being published in two books this year. None of them asked where they could buy a copy. They have also at times actually mocked my blog, so chances are, they probably aren't reading this. But, this is just how they operate. 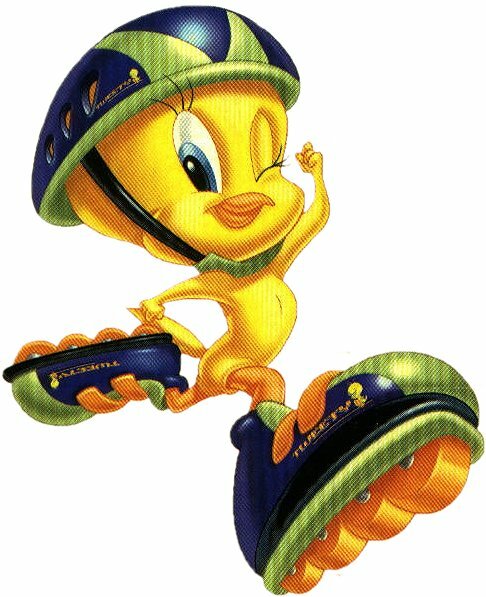 They say mocking things in an attempt to be funny and because I hate conflict, I rarely stand up for myself. Because I am so close to them, I crave their approval more than anyone else's. And I think because they rarely mete it out, I'm often left feeling bereft. These people probably have no idea that I feel they don't give me approval. They probably don't think about it much at all. I know they don't do it on purpose at all; they probably think that when they give me advice about a project I am working on that this is sufficient. I recently read in some self help book that approval is totally unnecessary. Having or not having someone's approval in no way affects the quality of my life. Even if someone couldn't give a crap about my precious LEGO Club, who cares? It doesn't affect the club in any way at all. So, why do I care so much? This is something I really need to get a grip on. But how? How do I get to the point that I don't care about other people's approval? Any advice? Because I think this will be my New Year's resolution: stop seeking approval from others, especially those who just seem incapable of giving me what I crave. My own approval should be enough for me, shouldn't it?